I despise niqabs. I really, really do. But I despise attacks on people’s freedom even more. There’s a difference between a woman in a veil and a jihadi sawing off a head. We need to remember that. While this particular narrative reiterates a certain discourse on civility and barbarity, and thus positions the niqab as inimical to Western values, it validates its use as falling within the bounds of religious freedom and thereby grants it the status of a tolerable practice. Interestingly, Wente acknowledges some of the Conservative Party’s political interests behind this move, locating it within a broader spectrum that includes the rise of ISIS, the Charlie Hebdo massacre, the “lone-wolf” attack on the Canadian Parliament building in October of 2014 by an alleged Muslim radical, and the spate of beheadings at the hands of the “Islamic State.” To this also we could add the Quebec Charter of Values affair, which previously sought to ban the wearing of all “religious symbols” for public employees (see my piece here), and the recently proposed anti-terrorism legislation, Bill C-51. 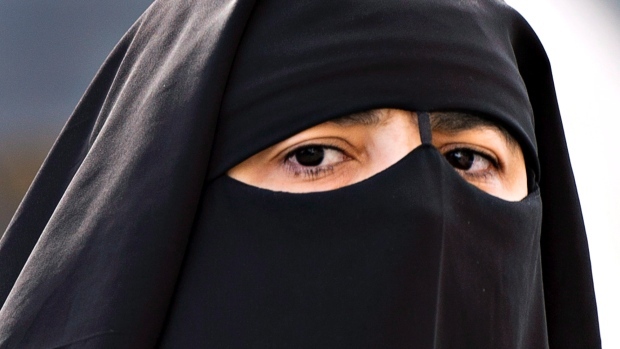 Although Wente does not contextualize these broader issues, she does argue that the prime minister is playing into a politics of fear by singling out the niqab for special attention, a move that other commentators have called racist. Wente also notes, however, that according to “internal polls” 8 out of 10 Canadians support the ban on niqabs during citizenship oaths, thus revealing a discrepancy, it would seem, between public opinion and what appears to be a contrary sentiment of the majority of journalists and academics around the country, as well as from all other major political parties with the exception of the separatist Parti Québécois. Moreover, it has been widely observed that this move by the Harper government to challenge the Federal Court is an attempt to create a wedge-issue during an election year, which has resulted in a surge of support in the province of Quebec, whose consistently left-of-center electorate appears to have warmed to the Conservatives in light of this issue. Here it is worth considering how the emphasis on Muslim women’s bodies has functioned as an easy target for waging proxy battles on larger ideological issues, including the assertion of “Western” values during a time when such things are perceived to be under threat. This entry was posted in Matt Sheedy, Politics and Religion, Religion and Society, Religion and Theory, Religion in the News, Theory and Method and tagged Charlie Hebdo, Conservative Party, ISIS, Jennifer Selby, Margaret Wente, Parti Québécois, Stephen Harper, Wendy Brown, Zunera Ishaq. Bookmark the permalink.